‘Death by plastic’ Is ocean garbage killing whales? Published on: July, 10 2011 – Channel Newsasia – AFP – ‘Death by plastic’ Is ocean garbage killing whales? – Channel NewsAsia. Millions of tonnes of plastic debris dumped each year in the world’s oceans could pose a lethal threat to whales, according to a scientific assessment to be presented at a key international whaling forum this week. A review of research literature from the last two decades reveals hundreds of cases in which cetaceans — an order including 80-odd species of whales, dolphins and porpoises — have been sickened or killed by marine litter. Entanglement in plastic bags and fishing gear have long been identified as a threat to sea birds, turtles and smaller cetaceans. For large ocean-dwelling mammals, however, ingestion of such refuse is also emerging as a serious cause of disability and death, experts say. In 2008, two sperm whales stranded on the California coast were found to have a huge amount — 205 kilos (450 pounds) in one alone — of fish nets and other synthetic debris in their guts. One of the 50-foot (15-metre) animals had a ruptured stomach, and the other, half-starved, had a large plug of wadded plastic blocking its digestive tract. Seven male sperm whales stranded on the Adriatic coast of southern Italy in 2009 were stuffed with half-digested squids beaks, fishing hooks, ropes and plastic objects. In 2002, a dead minke whale washed up on the Normandy coast of France had nearly a tonne of plastic in its stomach, including bags from two British supermarkets. “Cuvier’s beaked whales in the northeast Atlantic seem to have particularly high incidences of ingestion and death from plastic bags,” notes Mark Simmonds, author of the report and a member of scientific committee of the International Whaling Commission (IWC), which meets this week from July 11-14 on the British island of Jersey. How widespread the problem is, and whether it could threaten an entire population or species, remains unknown. “In many areas of the world, stranded whale carcasses are not recorded or examined, and in areas where strandings are recorded, examination of gut contents for swallowed plastics is rare,” said Chris Parsons, a marine biologist at George Mason University in Fairfax, Virginia. The majority of cetaceans that die from intestinal trauma getting caught up in fishing gear probably sink to the ocean floor, experts say. “There is, however, evidence that plastic debris in the seas can harm these animals by both ingestion and entanglement, and this needs to be urgently further investigated,” said Simmonds, Director of Science for Whale and Dolphin Conservation Society. 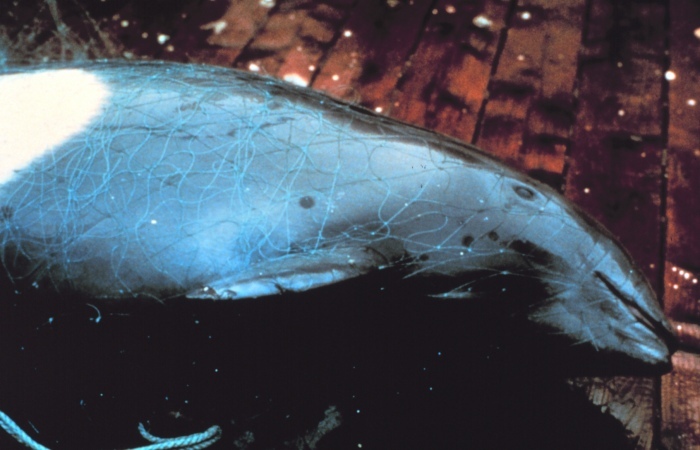 The main threats to cetaceans worldwide are accidental capture in fishing nets and climate change, he noted in an email exchange. Studies have shown that litter concentrates in so-called convergence zones — formed by currents and wind — where whales feed on abundant prey. Scientists have been slow to measure the impact of ocean refuse on animals living in or by the sea, and international organisations have been even slower in taking action. In 2003, the United Nations Environment Programme (UNEP) established the Global Initiative on Marine Litter, but it launched a detailed analysis of the scope of the problem only in 2009. More recently, representatives from 38 countries meeting in Hawaii in March adopted the “Honolulu Commitment” outlining a dozen voluntary measures. 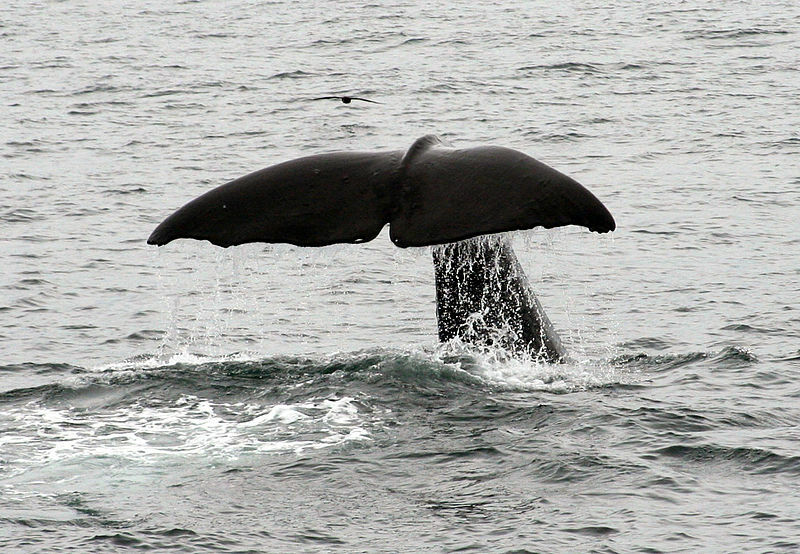 For whales, the level of threat from ocean garbage varies according to species and type of debris, the new report said. For toothed whales from the suborder Odontoceti, ingestion of plastic pieces appears to pose the greatest danger. Sperm and beaked whales are thought to be especially vulnerable because they are suction feeders. Less is known about the impact on filter-feeding or baleen whales (suborder Mysticeti), which consume huge quantities of tiny zooplankton and small, schooling fish. A single blue whale, for example, eats up to 3,600 kilos (8,000 pounds) of krill each day during feeding season. Potentially, the greater danger here is from toxins in plastic that breaks down over time into tiny, even microscopic, particles. Collisions with ships, and tissue-damaging noise pollution from off-shore oil exploration are additional threats, experts note. The IWC is riven between countries that oppose whale hunting, and those that back the handful of nations — Japan, Iceland and Norway — that defy a 1986 whaling ban or use legal loopholes to circumvent it. Are we in the west being hypocritical about Japan’s whaling? Published on: July, 08 2011 by Philip Hoare, Guardian.co.uk – Are we in the west being hypocritical about Japan’s whaling?. Next week’s open meeting of the International Whaling Commission (IWC) has a particular relevance, since it is to be held on British soil. In Jersey, delegates will debate what has become increasingly vitriolic in recent years. This year’s annual conference is sure to be contentious, after last year’s debacle over Japanese whaling and compromise put forward by the US and New Zealand, and which nearly ended in the collapse of the talks and threatened the future of the IWC itself. This year, things are even more extreme: the Japanese whaling fleet had to pull out of the 2011 season due to the direct action of Sea Shepherd in the Southern Ocean in February. New concerns over the cost of renewing Japan’s ageing fleet put the future of its operation in doubt. But that was before the earthquake and tsunami. Now, everything is up in the air: will Japan demand international sympathy and support for its hated whaling industry, and even increased quotas? Or will it see the tsunami’s destruction of at least one of its coastal whaling centres as a way to bow out gracefully from an embarrassing international impasse? Even more controversial, it has been accused of using its overseas aid budget to “buy” the votes of non-whaling nations. With that budget drastically cut by the demands at home, will it be unable to influence this week’s meeting? There are already rumours of a new deal being done between the US, New Zealand and Japan – to the fury of NGOs such as the Whale and Dolphin Conservation Society (whose 1.5 million-strong petition was influential in the failure of last year’s proposed compromise). Next week, protesters as disparate as Women for Whales and Surfers for Cetaceans promise a bumpy ride for any delegates arguing for the continuance of commercial whaling – not only from Japan, but Norway, Iceland, Denmark, the Faroe Islands, many aboriginal hunts and even new would-be whaling nations such as South Korea. Meanwhile, the Japanese accuse the anti-whaling lobby of the US in particular of double standards, since they allow the Inuit to hunt bowhead whales in the Arctic – whales which may live to up to 200 years, and are a threatened species. The Japanese, the Norweigians and Icelanders all argue that they are hunting minke whales whose numbers are increasing. Indeed, the Japanese call these baleen whales “the cockroaches of the sea”. Misinformation and intrigue, as ever, surround our interpretation of cetaceans, and what they may, or may not, mean to us. I’m writing from the Azores, having spent the week observing whales in their natural habitat. These deep waters are a sanctuary to cetaceans – up to 30 species, nearly one third of the known number of species – far from Japanese harpoons. Yet these, too, are under threat, more insidiously, from pollution and climate change; from military sonar and seismic surveys; from the sheer noise we make in the ocean. But they also suffer from our mere observance, from our expressed love for them as a collective species. Many argue that this multimillion-dollar industry is as much a threat to the whales’ wellbeing as the Japanese whale hunt, with too many boats chasing too few whales. I saw this happening earlier this year, off Sri Lanka, where the ending of the war with the Tamil Tigers has suddenly opened up swaths of the Indian Ocean to tourists coming to see its resident blue whales – a booming industry that is almost entirely unregulated there. What you observe, you also destroy. When it comes to whales, emotions always run high. We in the west have invested much in the conservation and protection of these astounding creatures – the largest, loudest, longest-lived animals on Earth. Unable to speak for themselves, we appoint ourselves their ambassadors. Yet next week’s crucial meeting in Jersey will once again raise the question: are we hypocritical in our attitude towards Japan’s cultural adherent to whaling, when our own actions, or inactions, do so much to damage the whales’ world?